Christmas is fast approaching, so Plus One Gallery wanted to share with you our top November picks! Last Tuesday we held the opening of Elena Molinari's solo exhibition 'The Alchemy of the Everyday' the evening unveiled her latest still life paintings which were very well received by all. The event was a great success! 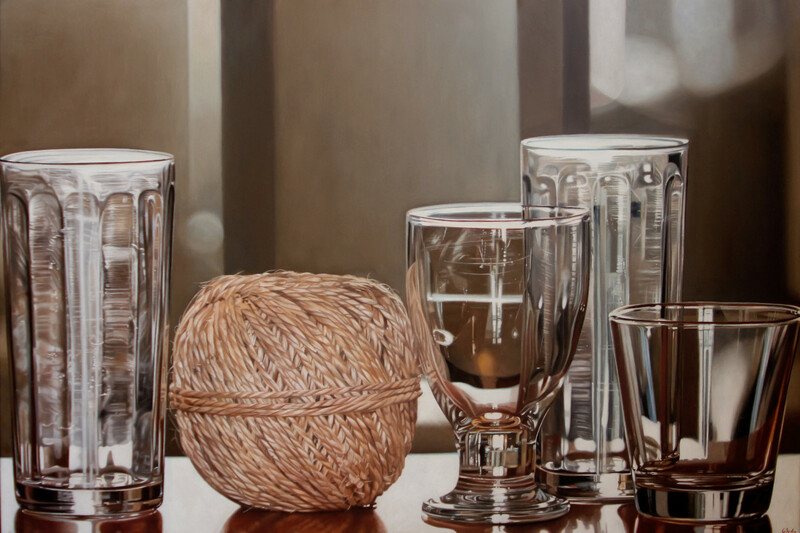 We celebrate Autumns tones with Steve Smulka and Jacques Bodin's beautiful still life paintings of reflective glass. Steve Smulka combines his signiture cool blues and glass arragements to create the frost of this season. Jacques Bodin reflects the warm autumn hues in his carfully arragned glasses. Fernando O'Connor's work combines his interest in the human figure and realism as a way to investigate subject matter. He creates well considered paintings as a result of academic training, personal searches and his influences. The results are highly unique paintings that put subject matter (whether these are objects or people) at the forefront of his work. Paul Cadden's pencil drawings never fail to impress and his compositions with water on the human figure, are unquestionably his most impressive. Maybe this is because Cadden believes hyperrealsim isn't just about representing reality but about creating the illusion of a new reality. In his own words, his creations "intensify the normal” and the perfect example of this is the way Cadden captures water in motion. With the Queen's birthday right around the corner there is no image that is more iconic than the queen's profile on our coins. Diederick Kraaijeveld once again manages to create mater pieces out of pre-loved wood. This is not the fist time that Kraaijeveld has tackled money as a symbol of value. Another gallery artist who is inspired by money and all that it can symbol. Tom Martin's "Makes the World Go Round" uses notes to create a globe against his signature cold blue background. Mastering a surreal approach to subjects, Martin explores the role of money in the way we live our lives. With the colder weather setting in its time to cozy up at home with some warming comfort food and nostalgia for company. And there is nothing better to conjure up British nostalgia than Cynthia Poole's depiction of our much loved baked beans - a British institution. Her acrylic paintings, inspired by pop art explores those brands we are faced with everyday.